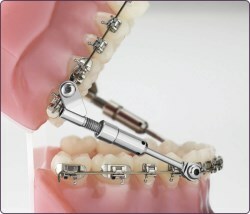 Herbst is an orthodontic appliance that can be used to correct an overjet in a patients mouth. Usually Herbst will be used in conjunction with braces, but in some cases can be a standalone treatment for overjets. An overjet is when you close your teeth together and your front teeth are sticking out in a crooked manner, which leaves a gap between the lower and upper teeth. This is quite often confused with an overbite, but an overbite is when your upper teeth cover more than half of your lower teeth when they are closed together. How Do You Get an Overjet? An Overjet can be down to genetics and how your jaw has formed when you were developing. It can also be linked to such actions as thumb/finger sucking, nail biting and even pencil chewing, which if these habits are continued over a long period of time, can deform the jaw and move the teeth, leading to an overjet. How Does Herbst Correct Overjets? When the Herbst has been fitted to the patient, it stops the lower jaw from falling backwards and promotes healthy bone growth in the lower jaw so its able to catch up with the upper jaw, and therefore meet for a nice natural bite. Like all orthodontic braces and appliances, at first when you have them fitted there will be a small period when they will feel strange in your mouth. However, you will quickly become accustomed to them and you will be able to speak and eat normally again soon as well. Is There Any Food I Should Avoid While Wearing The Herbst? With all orthodontic treatment we offer, our dentist will always advise you on the best practices to ensure you have the most enjoyable and successful of treatments, giving you the results you desire! Call us to arrange your free consultation today. At the free consultation you can discuss your case in detail with one of our highly trained orthodontic dentists.